TFL Registration begins next week! TFL Season 8 Registration will open up next week in Alston! If you would like to be a sponsor for the TFL league, please contact Sweegy Manilow. 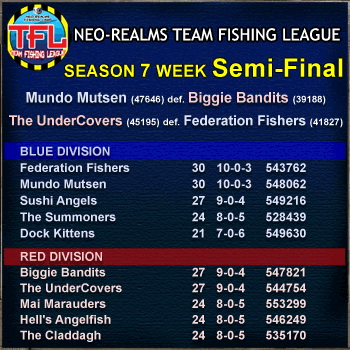 Congrats to TFL Champions: Mundo Mutsen! 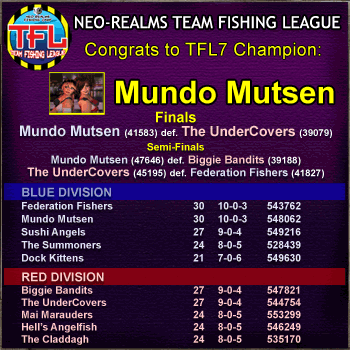 Congratulations to Mundo Mutsen, Season 7 TFL Champions! It was a great season, thanks to everyone who participated! 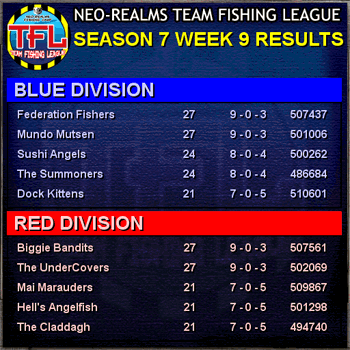 Week 10 Results, playoffs begin! The regular season is over! 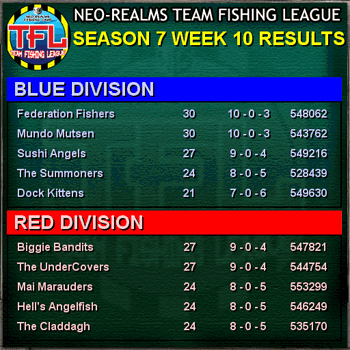 Congrats to Biggie Bandits, The UnderCovers, Mai Marauders, and Hell's Angelfish in the Red Division; and Federation Fishers, Mundo Mutsen, Sushi Angels, and The Summoners in Blue Division who made it into the top 4 prize money slots! Thanks to everyone who participated in this season's TFL, and good luck to the teams in the playoffs! Only one more week to go before the playoffs! Good luck everyone!